winter has finally arrived in los angeles. i drove home from santa barbara yesterday in a steady downpour and there’s been a bit more rain today. now at 5:06 pm the clouds that remain are setting up a terrific sunset display. the heat is on in both rooms. the cats have been napping in their winter spots, not stretched out on the wood floors, lounging across desks, or on the orange vinyl swivel chair as they are wont to do in warmer conditions. i’m just here, readying my mind for a return to the classroom. thinking about the incoming tide. wondering what color the water is right now. hope you’re well. doing things that please you. see you soon! Beautiful! Love the little scratching sand piper (?) bird! Oh, how I would love to spend a week at the sea! Love your sketchbook pages! It’s cold over here. Freezing. Fire in the woodstove. Just finished a blurb book about Stockholm and Gotland. 240 pages. They have 50% off until tomorrow! I hope you had a good day with the kids at school today and the transition from the sea to the classroom wasn’t too hard. 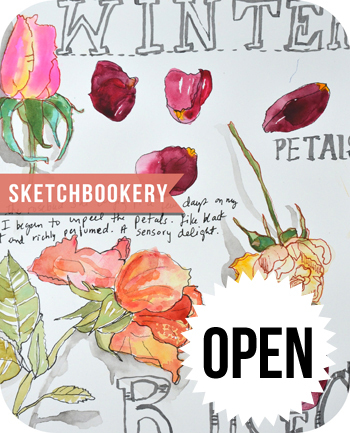 Will you share their sketchbooks again? Hi Mary Ann, So glad you enjoyed your time by the sea. Love your squirrel sketch! They’re my little babies. Welcome back, Mary Ann! I imagine you would rather have lingered longer, but I am glad you had the rest and relaxation you did. Your art…I just sit and stare at it. Such a delight! Thanks for including us with all of the photos and paintings. I spent all day yesterday ordering Christmas gifts for kids and grandangels online and I am almost done. A few more to order tomorrow. And it’s not even December yet! Woot! Also, there was a Downton Abbey marathon this weekend, and having missed all but season 6 when it was so popular, I have recorded all of it, and spent an inordinate amount of time watching some of it. LOVE that time period and the British setting. As far as painting goes, my daughter and fiancé just moved into a 100 year old Victorian house, so I spent some time there helping them paint. Quirky! Just a wee bit of art this weekend, and I miss it. Missed you too! Have wonderful time with the kiddies. Is there really such a thing as too many peanut m&ms? Who knew! And are you sure? Nice sketches. I love the way you painted the notebook paper list. When you paint squirrels, it always makes me smile. I’ve spent Thanksgiving week-end binge watching The Crown on Netflix. Have you seen it yet? It’s very well done. Love, love love your sketches! !